Whilst you want your wedding as a whole to be stunning and special, your wedding day is ultimately about you, the Bride and Groom. Obviously you want your guests to have a fantastic day, but don’t get too caught up on this, bring the day back to yourselves! Its a celebration of your future life together and should be special for the two of you. Its a really lovely idea for the Bride and Groom to do something special for each other. The small details really can make your day perfect. We wanted to share with you some of our favourite details that Brides and Grooms have done for each other. Writing letters to each other to be opened on the wedding morning is a really special thing to do. Hand written letters are really romantic and after spending the eve of your wedding apart it will be really comforting and touching to read letters from each other. The letters are just between the two of you so you can write from the heart exactly what you are feeling. 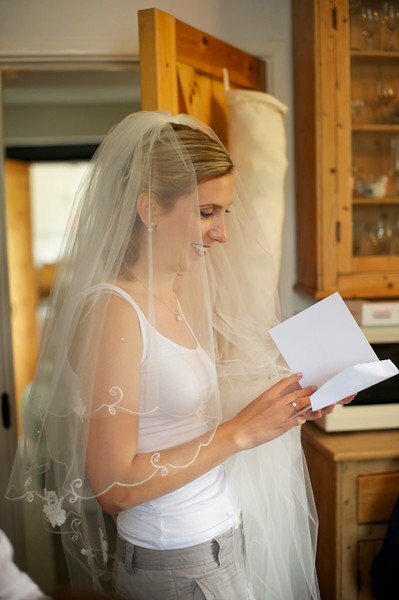 Ask the Best Man to deliver the letters to the two of you on the morning of the wedding so that you don’t see each other before the ceremony and so that you don’t get tempted to open it the night before! If writing a letter really isn’t what you are about as a couple then draw illustrations instead. They will be treasured forever. Giving each other gifts on the morning of the wedding is also a lovely idea. Its a popular idea for the Groom to give the Bride jewellery or perfume to wear on the wedding day. 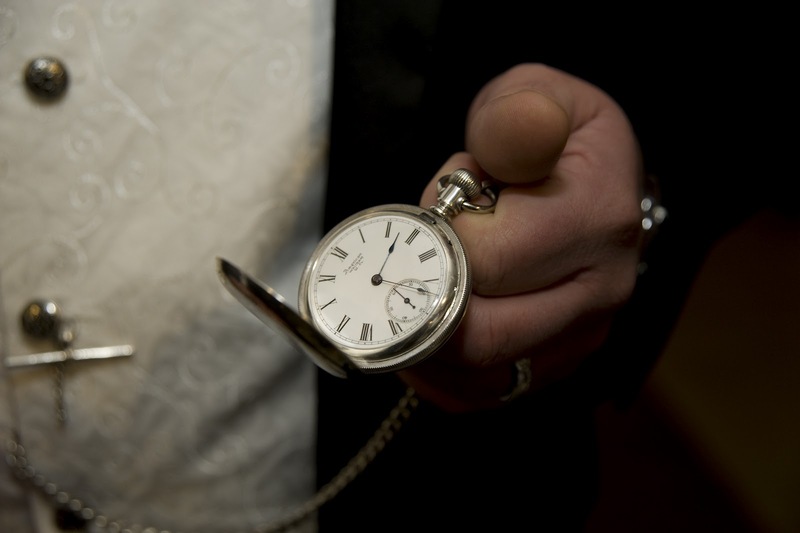 It is also popular for the Bride to give the Groom cufflinks or a pocket watch to wear on the day. Why not make it even more special by having the item engraved. It could be engraved with your initials, the wedding date or why not even have the co-ordinates of the wedding venue engraved? If you want to create something even more personal then create a scrap book or memory box filled with all of your special memories so far, something you can continue to add to throughout your future together. Create a time capsule on your wedding day! On your wedding day write letters to each other and seal them in envelopes. Place the letters in a chest with a bottle of champagne or your favourite wine and then seal the box. Open the box on your 5th wedding anniversary (or 1st if you don’t think you can wait that long!) and then read each others letters whilst you enjoy the bottle of champagne. To make it even more special, get your guests to sign the bottle of bubbly or wine. You could always extend it so that your guests write messages to you to put in the box or provide a Polaroid camera for them to take photos of themselves at your wedding to put into the box which you won’t see until you open it 5 years later! Guaranteed that it will bring special memories of your big day flooding back to you! Everyone loves a surprise- especially on their wedding day. 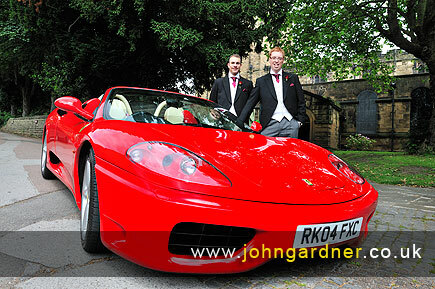 A wedding car is usually something that is booked for the Bride but not necessarily for the Groom so why not surprise him with one on the morning of the wedding. Or if the Bride has given up her dream wedding car to pay for other parts of the wedding then book it for her as a surprise- she will be bowled over at the gesture! 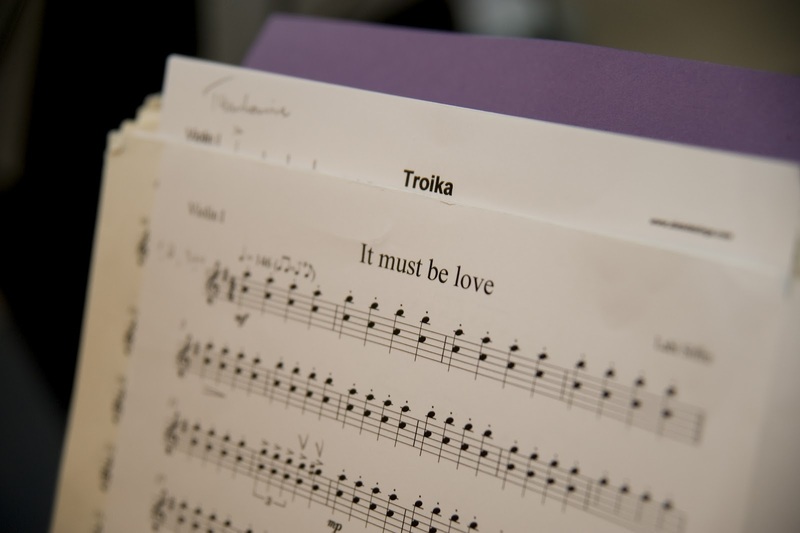 Music is a big part of any wedding day. Does your Bride or Groom have a favourite song or is there a song which is ‘yours’? If you don’t want the full version blaring out whilst you leave the ceremony then ask a string quartet or an acoustic singer to do a special arrangement for you as a surprise. It will be worth it just to see the look of surprise and excitement on your Bride or Groom’s face. Bellissimo’s Melanie did this for her husband at their wedding. One of her husband’s favourite songs is ‘It must be love’ by Madness and they had chosen to have a string quartet at their ceremony as opposed to tracks played from a stereo so she asked them to do a special arrangement of his favourite song so that they could leave to something more upbeat and to something that had real meaning to them. Four years after their wedding and he still talks about it and is still bowled over by the fact that she did it for him. 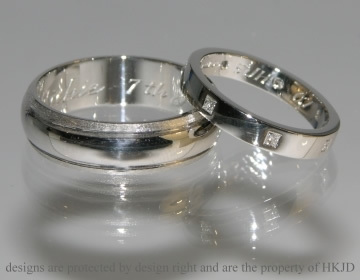 Design your wedding bands together so that you have something unique and something that has a bit of each of you in it rather than buying plain bands from the jewellers. Or if the Groom is feeling confident then he could design them as a surprise for the Bride! The fact the Groom has designed them will make them really special and one of a kind. If you don’t want to design them yourselves or you can’t afford to then get the inside of the bands engraved with a special inscription to make them personal and unique to you. The date of your wedding is always a great way to make your wedding bands unique or how about the title of your first dance? Melanie and her husband have ‘always follow your heart’ engraved into their rings- it should be something special to you both which means something really special. Your wedding dress is something to treasure and keep forever but the Groom’s suit often doesn’t have the same significance. Make the Groom’s suit really special by having a bespoke suit made- after all unlike your dress, the Groom’s suit is something that can be worn again and again over the years. Your special day will be remembered on every special occasion that the suit is worn. To make it really special, have your wedding date embroidered onto the collar of the jacket. It won’t be seen when he’s wearing it but you’ll both know its there as a special memento from your day. Melanie’s husband had this done for their wedding and they both signed the collar on the wedding day. We love all of these ideas- they are so personal and romantic! What did you do for each other on your wedding day? We would love to hear your stories! Please share them with us on our Facebook page!